Ideal solution for a family stay of 4/6 people or couples of friends with small children who want to enjoy their vacation in privacy but without sacrificing the comfort and services offered by a tourist facility such as our farm. A completely independent villa, which is on two floors for a total of 133 mq. immersed in the green of the seal in a reserved position. The villa is composed on the ground floor with a large living dining area, kitchen and a small bathroom while upstairs there are two bedrooms (sleeps 4) and two bathrooms. The living area is equipped with a comfortable sofa bed. The living room of the villa is also equipped with a large fireplace, freely usable by our guests, to recreate a very suggestive atmosphere in colder periods. The kitchen is provided with all the necessary utensils for the living room. A full change of linen is done every week (no towels are provided for the pool). Additional linen changes can be made on request, with an additional charge to be paid locally. 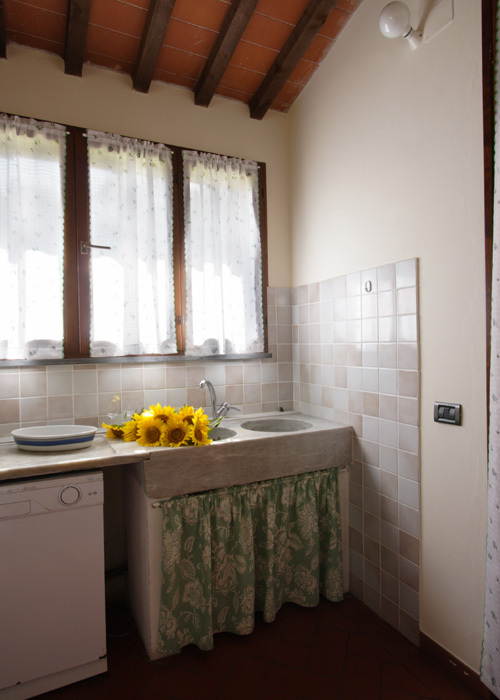 The villa is also equipped with independent heating. The villa has a large outdoor porch overlooking the forest equipped with table and chairs for outdoor dining and comfortable armchairs to relax.